This is the finest corriander seed powder you'll find, fresh arrival from Thailand, packed to the highest quality standar by Hand Brand. Open the package and it fills the room with a pleasant earthy fragrance. We've been using this on all kinds of summer spice rubs, it goes well with anything you're putting on the barbecue. A nice large, generous size, far more than you will find in local supermarkets packed in tiny jars. 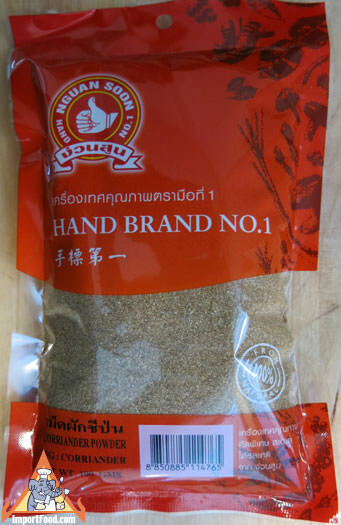 Corriander seed powder, pounded together with Thai pepper powder and garlic, is called a natural "Thai MSG" by the Prime Minister of Thailand, and can be used in just about every Thai dish. Northern Thai Style Sausage, "Sai Grok"
It's ground to a medium fine powder. We also offer corriander seed, and find that grinding the seed in a mortar and pestle is more time consuming. Ingredients: corriander seed powder. All natural, no artificial ingredients or preservatives. Product of Thailand.